Many Mountlake Terrace jazz students were not in a good mood on Saturday, Jan. 26. The day prior, they had to get up early and leave the school at 7:30 a.m. to take a seven and a half hour trip to the University of Oregon in Eugene. They stopped for lunch in Vancouver, and were pretty sure that junior saxophonist Caden Hargrave picked up food poisoning from his sushi. After that, they stopped by Judson Middle School in Salem, Oregon, to watch their jazz ensemble, taught by MTHS alumnus Nathaniel Irby, perform. Finally, their charter bus rolled up to the Phoenix Inn, where they unpacked and could relax, and watch some of the performances by the featured bands at the Oregon Jazz Festival. Saturday, however, was even more hectic. The events began at 12:15 p.m., with a performance and Q&A session with three time Grammy-winning trombonist Alan Ferber. This set the event’s tone as decidedly different than other festivals the bands had participated in: it wasn’t meant to be competitive. Ferber’s quartet, made of University students, played simple charts that appear in Real Books – familiar to all jazz students. During his Q&A, he stressed that fulfillment did not come from acclaim, and instead stemmed from improvement. Ferber strikes one as someone who has not let their accolade go to their head. He spoke from humble experience, connecting well to the audience of students and educators. Afterward was the start of the high school performances, and Terrace’s Jazz 2 was one of the first on the program. They headed to the rehearsal room which was conspicuously missing a drum set. Their warm-up seemed to be over in an instant, and after running through their songs briefly, they were ushered on stage. 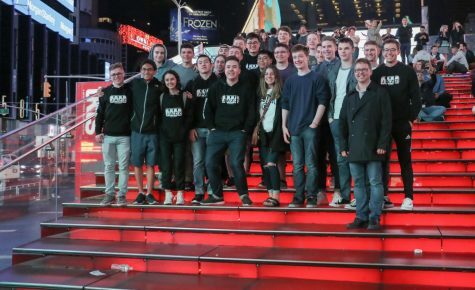 Jazz 2 had already performed two of their pieces, “Moon Over Cuba” and “Rockabye River” at the Ari Hoenig concert last November. “Rockabye River” has senior Daniel Leavitt on a saxophone feature and freshman Eli Faris on trumpet, and “Moon Over Cuba” featured soloists sophomore Sophie Stelmack on the trombone, and junior Ryan Baca and sophomore Emily Sallee on tenor sax. Their remaining piece, “I Left My Heart in San Francisco”, is a familiar, meandering ballad made popular by crooner Tony Bennett. It featured a thoughtful solo from sophomore Jonas Rivera on tenor sax. Jazz 2 had already received coaching from clinicians Justin Dicioccio and Ari Hoenig, but after the concert they headed to a larger rehearsal room for feedback from University of Oregon instructor Steve Owens. All of this hard work to hone these pieces to perfection resulted in a performance that was razor-sharp. “I think it went really well, I think it’s the best we’ve ever played those songs,” Baca said. By then, it was nearly time for Jazz 1 to begin rehearsal. They headed to their practice room, and began warming up. They were already well-practiced. The musicians had spent the prior Monday rehearsing for seven hours to bring these pieces up-to-snuff for recording, in order to send them to the Essentially Ellington judges in New York. In addition to that, they had met on Thursday after school to further rehearse and do a last minute recording. 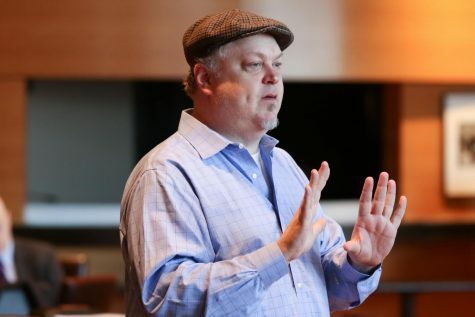 Those recordings were due the Friday they were set to leave for the Oregon Jazz Festival, so instructor Darin Faul toiled in his office until 11:00 p.m. on Thursday night finalizing them. Nevertheless, the band ran through their scales and licks, and when it became clear that Faul was occupied with something else, senior trombonist Henry Smith-Hunt instructed the band to run through their pieces. Because of the absent drum set, senior drummer Kieran Faris and junior drummer Josh Setala kept time by hitting a desk with their sticks, whisks and mallets. Faul came, gave the band a few critiques about their intonation and then they were shuffled onstage by their university student handlers. Jazz 1’s set began with “Magnolias Dripping with Molasses”, a tune heard at the concert in November, featuring solos from junior Ernesto Torres on trumpet, junior Owen Moreland on clarinet and Smith-Hunt on trombone. A slick composition called “Whisper Not” came next. It was originally written for Dizzy Gillespie’s big band, and is a challenge for all, regardless of skill level. With numerous solos and a large dynamic range, it is certainly hard to pull off well. However, senior Ben Leonard and junior Caden Hargrave, on the tenor and alto sax respectively, were able to solo beautifully, with complex improvisations that exhibited their technical skill. Torres’ trumpet solo fell back on styles of bebop soloists such as Dizzy Gillespie himself, and his chromatic lines, triplet feel, and smattering of impressively high notes resulted in an engaging performance. Sophomore Andrew Vinther also laid down a solo full of a mixture of tritone substitutions and polyrhythms. Next was another piece by Ellington, “Prelude to a Kiss”. Nostalgic, sweet, romantic, and with a building intensity, it featured Hargrave on his alto saxophone. He played up to the standard legendary saxophonist Johnny Hodges had set in the original recordings, with a dulcet tone that conveyed all of the emotion and longing critical to the feeling of the piece. Hargrave is a natural soloist, able to come up with beautiful and complex refrains over changes on the spot. The most incredible part? He makes it look easy. “Prelude to a Kiss” also featured a beautifully expressive introduction on piano by sophomore Natalie Song. The tone of the next piece, “Afro Bossa”, was wildly different. Sometimes also referred to as “Bula”, this Ellington composition has an air of mystique and a rigid undertone. Beginning with standalone drums played with mallets by Faris, then easing into a haunting and almost seductive melody, and finally building to screaming crescendo. Solos on this piece were performed by junior Owen Moreland on clarinet, junior Solomon Plourd on trumpet, and Hargrave again on alto sax. Finally, to finish off, they chose a song that would ensure they made an impression: “Swinging the Blues”. Though on paper, it may appear as a typical, even pedestrian, 12 bar blues, “Swinging the Blues” as performed by the Jazz 1 ensemble is anything but. Its structure allows for numerous solos throughout, allowing individual talents to shine through without overshadowing their strength as a group. Said solos were another piano introduction by Song, Torres and senior Vegard Perander on trumpet, as well as Leonard and Moreland on tenor sax. The mood, though host to the usual post-concert euphoria, was not fantastic afterward. “I think it went… Maybe not NYO-worthy. Definitely not NYO worthy,” Setala said, in reference to the National Youth Orchestra, for which some band members were planning on auditioning. That attitude was the exact opposite of the clinician whom they saw immediately after their performance. Owens could not cease his adulation. So fantastic, in fact, that they were selected to perform in the final performance. After more clinicians, that is. The band split into three sections: rhythm (piano, drums and bass), brass (trumpets, trombones and perhaps other, more exotic horns) and saxophones. There, they met with University of Oregon faculty members corresponding to their sections. For the rhythm section, they met with Jason Palmer, an internationally prolific percussionist. He spoke at length about how difficult it is to replicate the sounds of bands from the 1940s and 1950s because of historical differences in equipment. bBass drums were larger, but thinner. Hi hats had more of a tilt, and were a little looser. Not only that, but because of improvements in amplification technology, bassists, like Vinther, no longer have to play as loud to ensure that the band stays at the correct tempo. Because of this, bass playing form has changed. He advised Vinther to utilize the weight of his whole body when plucking, to achieve a fuller sound. 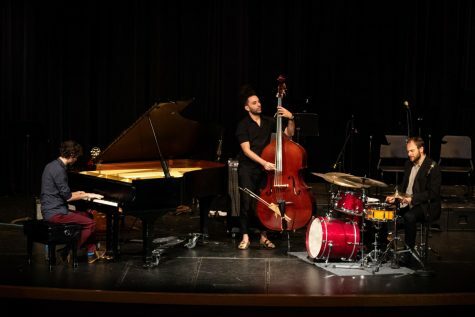 For sophomore pianist Natalie Song, he coached that a slight emphasis on certain beats could add momentum to the rhythm section, and create a kind of energy off of which the band could feed. But, if the emphasis is placed inappropriately, it could potentially just sound out of time. It’s tricky business. 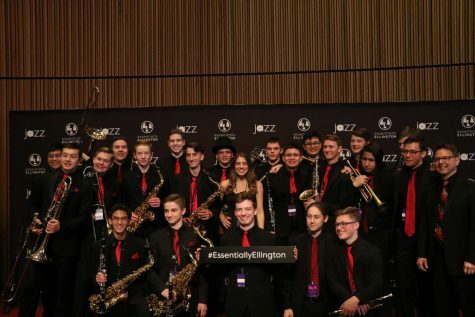 These are the kinds of nuances that these young musicians have been working so hard to achieve, because they’re the kinds of differences that can make or break an audition for Essentially Ellington. The band regrouped in the larger rehearsal room and debated over which songs they ought to play for their ten minute slot in the final concert. They had already played everything in their fist set that they had in their current repertoire. After much discussion, they settled on “Whisper Not”, and the crowd-pleaser, “Swinging the Blues” but with a heavily modified structure. “Whisper Not” had been changed to allow for an additional solo. Faris, who usually plays the drums, performed this time on the alto saxophone. An instrument he picked up one summer and decided to learn, his alto solo exhibited attentive and confident navigation of chord changes. In addition to him, Leonard, Hargrave and Torres delivered characteristically solid solos. Though in the same vein of the ones performed earlier in the night, they had nuance and alterations, in the true spirit of jazz. The fluidity and gradually building climax of “Whisper Not” primed the audience for the song to come. “Swinging the Blues” was played with an energy only possible at a live performance. Both Torres and Leonard worked extensively during the Monday and Thursday rehearsals to perfect their solos. They were rhythm based solos, designed to make the audience feel like they ought to get up and dance. While not necessarily technically complex, it takes a certain skill to recognize the right choice when deciding between a display of skill and being able to serve the music and have fun with it. Other solos included Song on piano, Moreland and Leonard on tenor sax, Hargrave on alto sax, Torres and Perander on trumpet, Smith-Hunt on trombone,and a tag-teamed drum solo, with Faris on the kit and Setala on a spare snare. “Swinging the Blues” was the perfect number to go out on, and left the crowd buzzing and the room resonant with uptempo swing. It was an exciting end to the student performances, and the band members filed into seats to watch the final performance of the Oregon Jazz Festival. 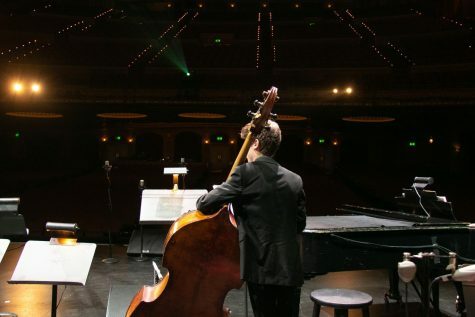 Alan Ferber returned, this time with the University of Oregon jazz ensemble. They performed four of Ferber’s original compositions. It gave all the students in the auditorium an impression of what their not-too-distant future could hold. But, in their immediate future, they would file into the local restaurants for dinner, and relish in post-concert glory until they could get back to the hotel and have a well-earned rest. Amy Harris is a junior, and this is her third year associated with the Hawkeye, but her first as a lifestyle reporter and photographer. 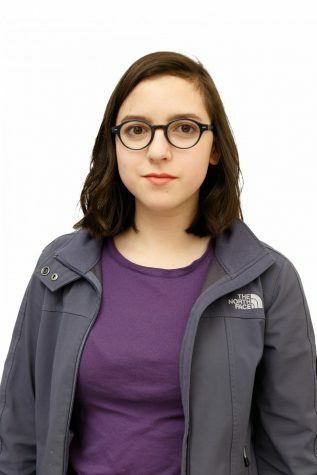 As a student, she is involved in Technology Student Association, and has a passion for drama. She enjoys writing about music, especially MTHS' award-winning jazz program, and all of the other events that make MTHS an engaging community.